In case you missed it – Habitat for Humanity Central Arizona is thrilled to announce the return of Women Build! With the help of local business women, we are bringing back this once successful model of home building and female empowerment. In the year of the woman, the timing is right and we have an incredible group of volunteers leading the charge! We would like to invite you to participate in this amazing opportunity. The Women Build will be a home funded and constructed primarily by women. A group of female team leaders will manage the construction of the home. Valley women will build their own team, much like a marathon, each team member will raise $300 to take part in the build. Fundraising captains can claim great prizes like pink tool belts, hard hats, or a spa weekend, all while building a network of friends. We will host three major build days with up to 75 women on site. We also plan to have massage therapists, fitness professionals and a DJ on-site, for a celebration feel and an even greater opportunity to network. Fundraising teams will continue working until November seeking sponsorships in a variety of ways. Our goal this year is to reach $75,000 towards the construction of a home for a single mother. If you have a women’s group or network in your company, please share this opportunity with them! We would love to have a team from your company get in on this build! Learn more about building a team or participating as an individual! • Sponsor a meal during Women Build! Breakfast, lunch, snacks or beverages. • Donate swag, coupons or raffle prizes to the cause! • Share this information with your contacts! Help us spread the word about this awesome opportunity! I’m interested in the Women Build. Hi Marliena – That’s great to hear! Thanks for thinking of Habitat. The best way to get started is by visiting https://habitatcaz.org/womenbuild/ or send an email to micaela@habitatcaz.org – Thank you again! Hi Lori – That’s awesome! 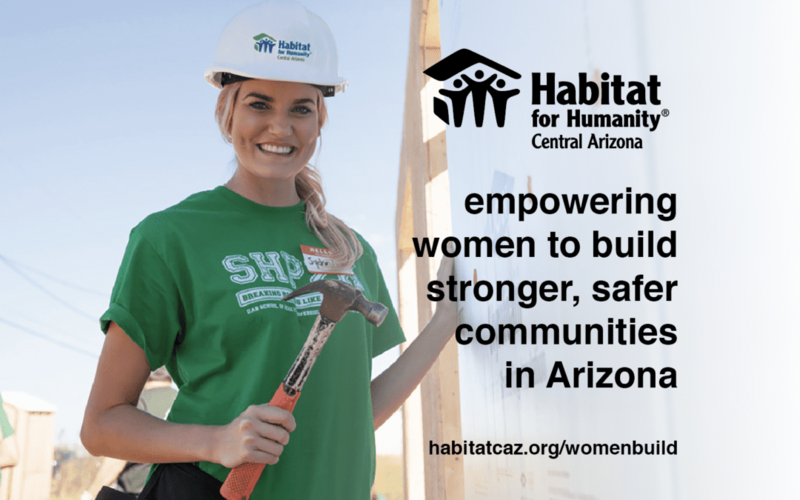 To get signed up for the upcoming Women Build, please visit https://habitatcaz.org/womenbuild/ For all other volunteer opportunities, check out https://habitatcaz.org/volunteer Thanks again – hope to see you guys soon! Does HFH offer help to a senior woman in need of a home to get out of my RV? Where do I apply? I am able to help build. I just can’t live in an RV much longer…..
Hi Paula – Thanks for asking. Please take a look here for information on how to apply: https://habitatcaz.org/apply/ Thanks again!